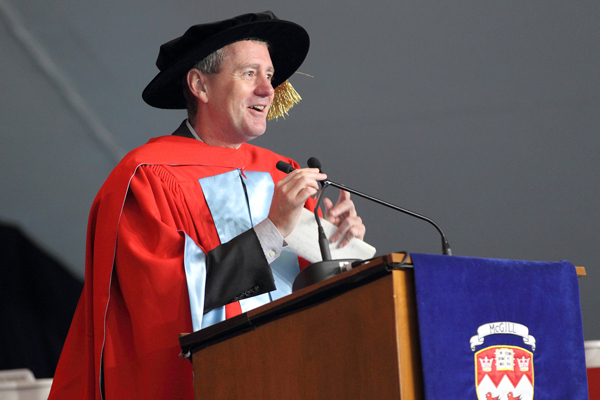 Watch the respective Convocation address of each Honorary Doctorate. 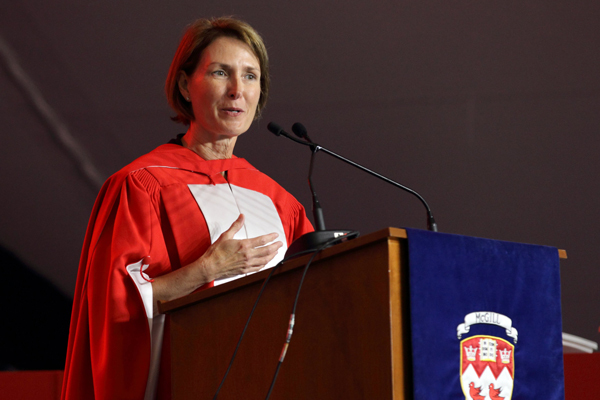 WADE DAVIS (Doctor of Science), School of Continuing Studies – Tuesday, May 27, at 6 p.m.
MARY ELLEN TURPEL-LAFOND (Doctor of Laws), Faculty of Law – Wednesday, May 28, at 10 a.m.
WAYNE RIDDELL (Doctor of Music), Schulich School of Music – Wednesday, May 28, at 2 p.m. Considered one of Canada’s most accomplished choral conductors, Wayne Riddell is credited with having raised the profile of church and chamber choirs in Canada to a new level while exploring a range of musical styles that vary from the standard repertoire to new music by Canadian composers. Founder and former director of the Tudor Singers, Mr. Riddell and the Singers toured Canada from coast to coast; their performances were frequently broadcast on the CBC. He is also known as a great pedagogue, “a choral trainer of genius.” Organist-choirmaster at Westmount Park United, Erskine and American United, and the Church of St. Andrew and St. Paul, Wayne Riddell is a graduate of McGill, where he has also taught. 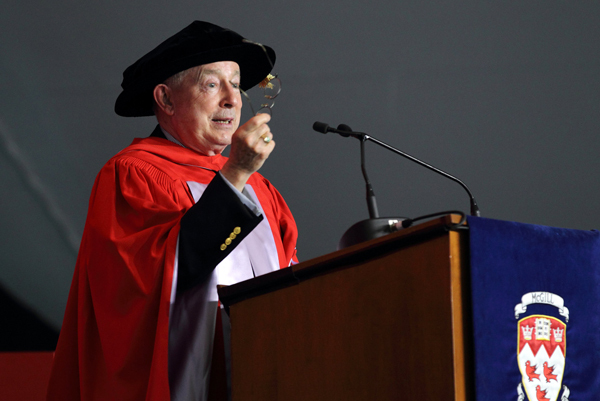 He is the recipient of many awards, including the first Healey Willan Prize from the Canada Council for the Arts, as well as the Order of Canada. KRISTINA M. JOHNSON (Doctor of Science), Faculty of Engineering – Thursday, May 29, at 10 a.m.
CAROL L. PRIVES (Doctor of Science), Health Sciences (Faculty of Medicine and Faculty of Dentistry) – Thursday, May 29, at 2 p.m.
A native Montrealer, Carol Prives earned a BSc and a PhD from McGill. After postdoctoral training at the Albert Einstein College of Medicine, she spent several years at the Weizmann Institute before joining the Biological Sciences Department at Columbia University. 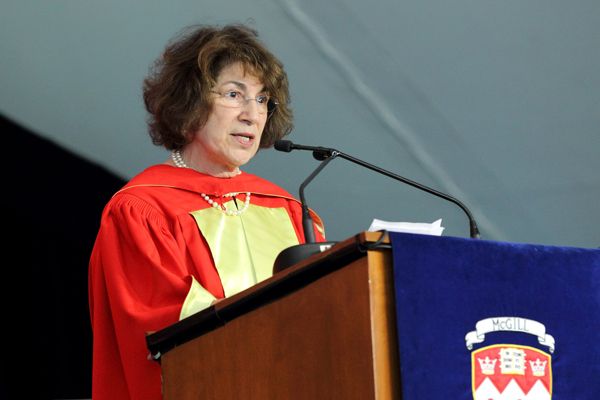 Since the late 1980s, her work has focused on the p53 tumour suppressor protein, the product of the most frequently mutated gene in human cancers. Her work illuminated how p53 regulates normal cell growth and malignancy. Carol Prives is an American Cancer Society Research Professor and a member of the American Academy of Arts and Sciences, the Institute of Medicine and the National Academy of Sciences. 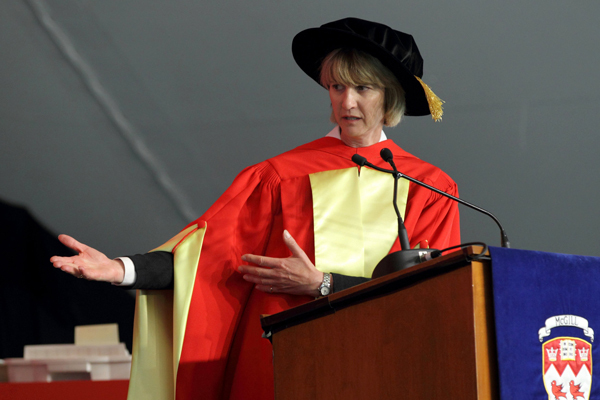 She has received, among other distinctions, the Rosalind E Franklin Award for Women in Science, the Paul Jansen Prize in Advanced Biotechnology and Medicine, and the AACR-Women in Cancer Research Charlotte Friend Memorial Lectureship Award. 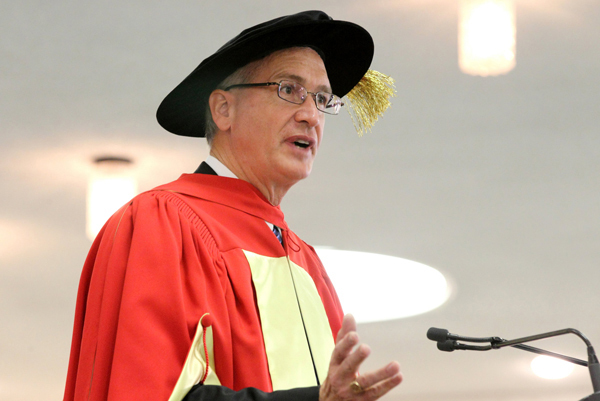 JOHN WOOD (Doctor of Letters), Faculty of Education – Friday, May 30, at 10 a.m.
JOHN MCCALL MACBAIN (Doctor of Laws), Desautels Faculty of Management – Friday, May 30, at 2 p.m.
RANDALL S. PRATHER (Doctor of Science), Faculty of Agricultural and Environmental Sciences – Monday, June 2 at 10 a.m.
GURDEV S. KHUSH (Doctor of Science), Faculty of Agricultural and Environmental Sciences – Monday, June 2 at 2:30 p.m. World-renowned agronomist Gurdev Singh Khush joined the International Rice Research Institute (IRRI) in 1967 and was appointed head of the Plant Breeding Division a few years later. During his career at the IRRI, Dr. Khush spearheaded the program for developing improved rice varieties which ushered in the green revolution. He conceptualized and developed a new type of rice, popularly known as super rice, with a 20 per cent higher yield potential. Time Magazine highlighted super rice as one of the best environmental stories of 1994. The adoption of these modern varieties has helped double the world’s rice supply and enabled self-sufficiency in most of the major rice-producing countries in the world. For his contribution to world food security, Dr. Khush has been the recipient of many worldwide awards and recognitions, including the 1996 World Food Prize and the Wolf Prize in 2000. 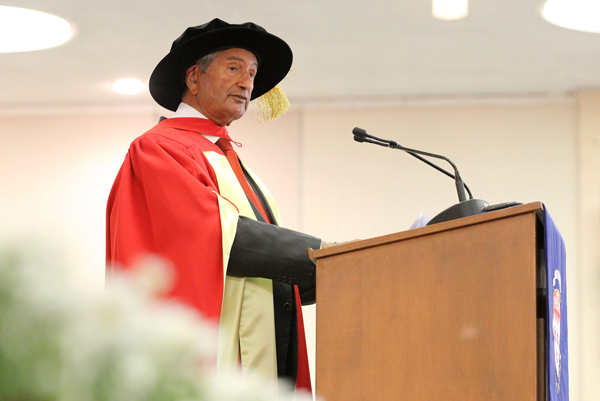 Ronald P. Cantrell, former director general of the IRRI, summed up Dr. Khush’s contributions by saying: “While his name may have passed the lips of many, his life’s work passed the lips of almost half mankind.” Gurdev Singh Khush is a graduate of Punjab Agricultural University and the University of California. KAREN ARMSTRONG (Doctor of Divinity), Faculty of Arts and Faculty of Religious Studies – Tuesday, June 3, at 10 a.m.
A devoted student of comparative religion and one of the world’s leading commentators on religious affairs, Karen Armstrong is dedicated to bringing the various religious groups around the globe to a better understanding of each other. In her recent Charter for Compassion, she brings together the voices of people from all religions; she reminds the world that all different faiths, while distinct, share the core principle of compassion and emphasizes that compassion entails putting oneself in the position of the other. An ambassador for the United Nations Alliance of Civilizations, she is the recipient of many awards including the Roosevelt Institute’s Freedom of Worship Award, the Swedish Nationalencyklopedin’s International Knowledge Award, the TED Prize, the Jack P. Blaney Award for Dialogue, The British Academy Al-Rodhan Prize for improving Transcultural relations and the Morehouse College Gandhi/King/Ikeda Prize for Community Builders. 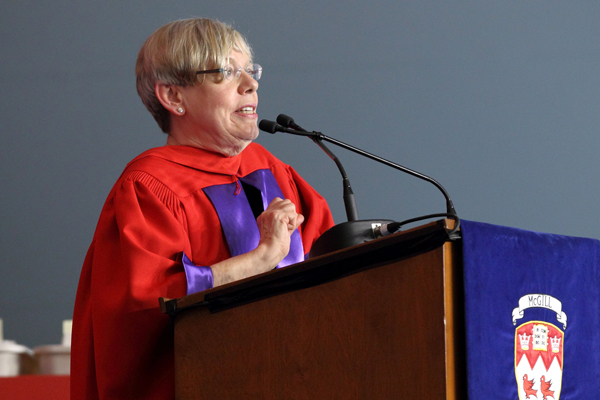 Karen Armstrong is a graduate of Oxford University. 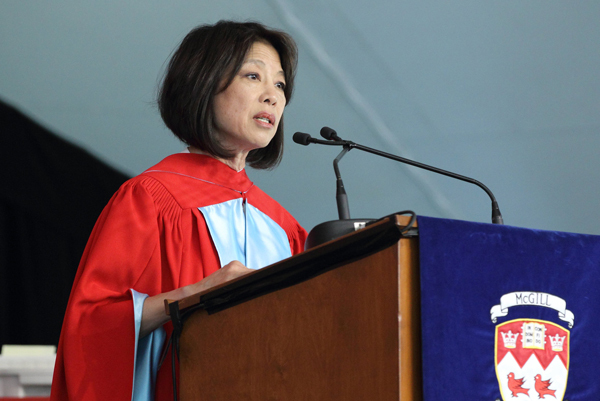 DENISE CHONG (Doctor of Letters), Faculty of Arts – Tuesday, June 3, at 2 p.m. Economist and author Denise Chong is a third-generation Canadian of Chinese descent whose books evoke everyday happenings and relationships amidst extraordinary times. Two of her books chronicle the immigrant experience by tracing the lives of Canada’s early Chinese families, including her own; two others, set against times of war and of social tumult, about individuals who ultimately are granted asylum in Canada, are a portrayal of courage and a paean to freedom of expression and human rights. In a 1994 speech on “Being Canadian”, she wrote: “My own sense of being Canadian is one of belonging. I belong to a family. I belong to a community of values,” and that has led her to give back to her country. She is noted for her civic engagement in social causes, most notably as a supporter of human rights and the arts. Denise Chong is a graduate of the University of British Columbia and the University of Toronto. 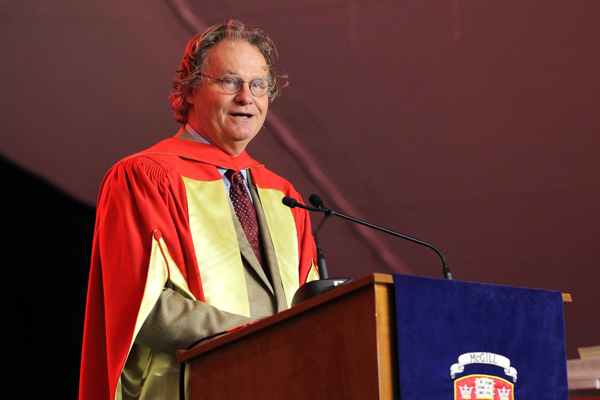 RUBIN GRUBER (Doctor of Science), Faculty of Science – Wednesday, June 4, at 10 a.m.
Rubin Gruber has been a successful entrepreneur in the telecommunications and data communication world for more than 40 years. He founded many companies and now serves on the boards of several others. 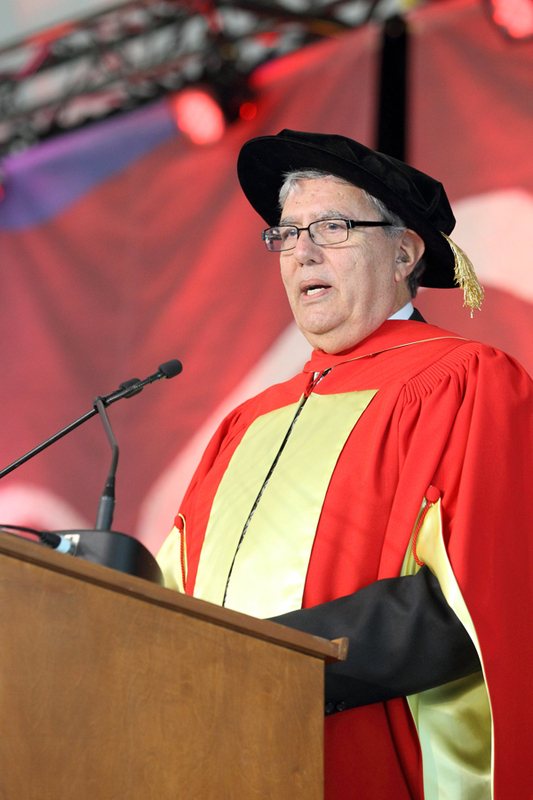 Mr. Gruber earned his Bachelor of Science degree from McGill in 1965. 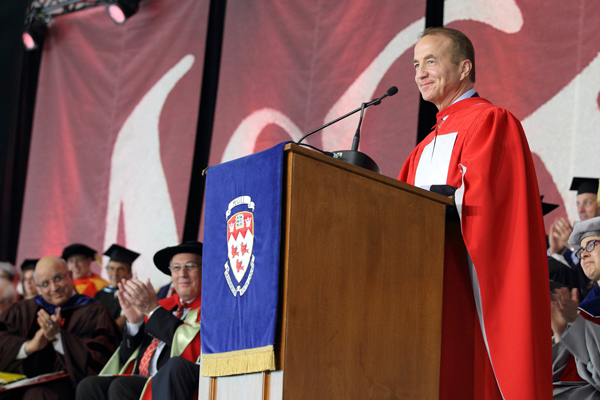 Having benefited from the McConnell Scholarships, he later established the Rubin Gruber Scholarships for McGill students. “Giving deserving students the ability to receive a quality education to ensure a better future for themselves and their families is the fundamental objective of establishing the McGill Scholarship.” In addition to the scholarship, Mr. Gruber has lectured to McGill science students on entrepreneurial fundamentals and start-up development strategies. Rubin Gruber also holds a graduate degree from Wayne State University. 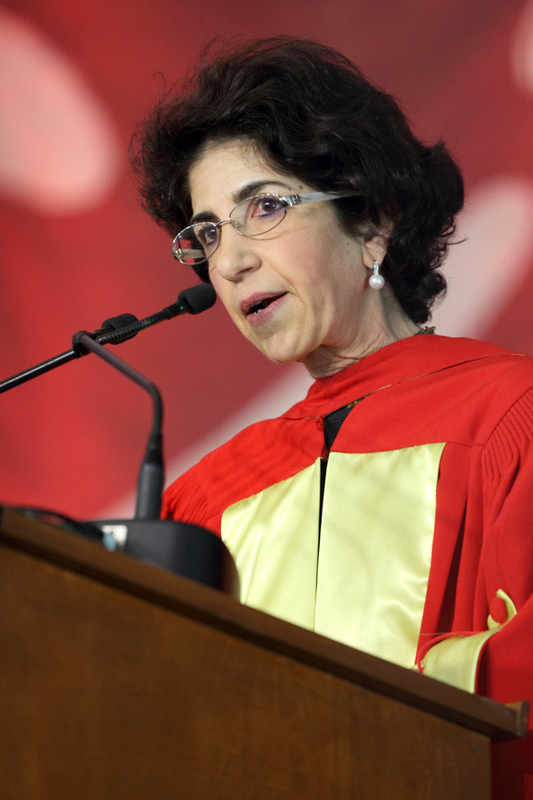 FABIOLA GIANOTTI (Doctor of Science), Faculty of Science – Wednesday, June 4, at 2 p.m.
Fabiola Gianotti’s scientific accomplishments and exceptional leadership have led to seminal advances in the field of subatomic particle physics. As the leader of the ATLAS experiment at the Large Hadron Collider at CERN in Switzerland – a collaboration of more than 3,000 scientists from 169 institutions and 37 countries and considered one of the world’s biggest scientific experiments – she played a determinant role in the recent discovery of the subatomic particle known as the Higgs boson. Fabiola Gianotti’s remarkable career achievements have been acknowledged beyond the scientific community: she was named as one of Forbes’ Magazine Top 100 World’s Most Powerful Women and in 2012 was a finalist as Time Magazines’ Person of the Year. Fabiola Gianotti is a graduate of the University of Milan.